Revamped Session Menu Lands in Ubuntu 11.10 - OMG! Ubuntu! An updated Session Menu containing links for various system settings has landed in Ubuntu 11.10 this weekend. The session menu, which is used to logout, shutdown, reboot, etc, sees easily accessible entries for ‘System Settings’, ‘Displays’, ‘Bluetooth’ and ‘Startup Applications’. Also listed is a notification on whether System Updates are ready to be installed. 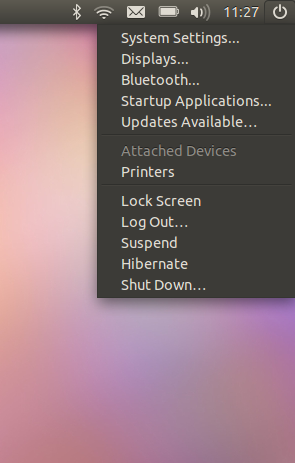 The revamped session menu is the latest menu change aimed for Ubuntu 11.10, following the removal of the Me Menu and the subsequent addition of its features to the Messaging Menu. As with all updates on Ubuntu 11.10 during development the items featured or reported on are still subject to change and should not be viewed as final.